This report is meant to inform the viewer of our current market opinion as of the date provided, which we, as professional money managers, use in our decision-making. These views can change at any time. It should be noted that stock market and bond market data are subject to varying interpretations and any one interpretation will not necessarily guarantee investment success. The information obtained from the sources specified herein and used as basis for our current market opinion is believed reliable, but we do not guarantee the accuracy of such information. Note, that XLK, as mentioned in the interview, is presently owned by some of Churchill Management Group’s clients and may be sold or purchased for others at any time. Watch Churchill’s President, Randy Conner, discuss taking a tactical approach on the RIA Channel. Fred Fern featured in Barron’s, “Top Advisors Talk About Their Firms – And Their Clients”. 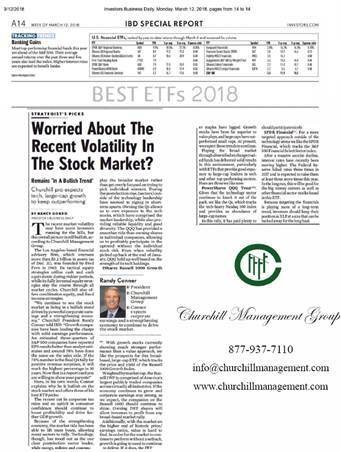 Churchill Management Group ranked a Top 40 RIA Firm by Barron’s Magazine.